Dolphins defensive coordinator Kevin Coyle is on the hot seat, and could get the axe with another poor performance on Sunday. There's no denying that the Miami Dolphins have had a poor season thus far. They're last in the league in sacks with one through three games, and rank 28th in rushing. Neither the offense nor defense has played particularly well, and it has led to some unsettlement in Miami. According to NFL insider Ian Rapoport, an ugly Week 4 loss similar to last week's could lead to a shakeup on the coaching staff, particularly at defensive coordinator. Players have reportedly lost confidence in defensive coordinator Kevin Coyle, particularly in his scheme. With players like Ndamukong Suh, Cameron Wake, and Olivier Vernon on the defensive line, it's surprising to see they only have one sack as a team. Additionally, Dolphins players were reportedly frustrated with personnel decisions — specifically with regards to undrafted rookie linebacker Zach Vigil taking snaps from Kelvin Sheppard, and slot cornerback Brice McCain playing outside over Jamar Taylor. There's a lot of unrest in Miami right now, and while the team can't afford another embarrassing loss, neither can Coyle. 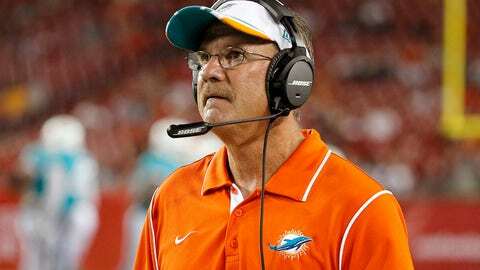 His job may be on the line Sunday, and it could be the change the Dolphins' defense needs.